Hi there! 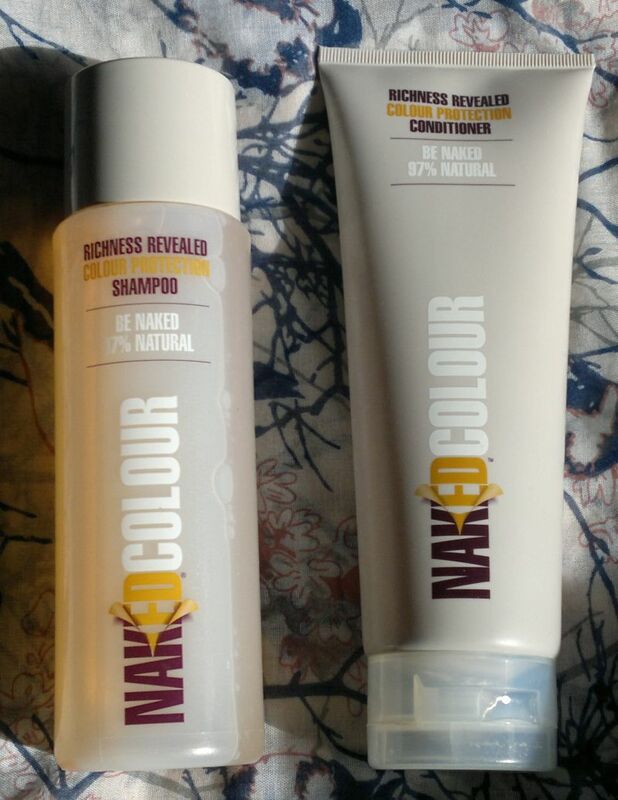 I’m currently working my way through my seemingly endless stash of toiletries and I’ve found a shampoo and conditioner combo which I bought a while ago: Naked Colour. These two products are 97% natural and they are SLS free. As such the shampoo doesn’t produce much of a lather unless you use a handful of product. This didn’t impress me at all because my hair is long and curly and if there’s no lather, I can’t cleanse my scalp and my hair properly. I also didn’t like the scent – ginger and cinnamon – which I’d describe as very spicy and even a little boozy. This means that, after rinsing, my hair didn’t feel or smell very clean. On top of that my hair felt heavy and completely unflexible and unelastic. 😦 Not good. At all. So I reached for the conditioner. On the back of the bottle it says that using plenty is recommended (yeah, right…). Well, I used about twice as much as I usually would and it wasn’t enough. I used another handful of product, but that didn’t do the job either. Then another handful… and it still wasn’t enough. I gave up. Then I rinsed my hair with water, gently ‘combing’ through it with my fingers – but my hands got stuck in the knotty mess that the conditioner turned my hair into. I tried to remove as many knots (yes, proper knots) as possible without pulling, but nothing helped. And despite not being able to get rid of the knots, I lost about five times as much hair as usual. Horror! The worst thing is that I remembered that I had already used this shampoo and conditioner combo a few years ago. Back then I hated these products just as much and I had to throw them out (= I gave them away…). If I’d had a blog to track my shopping back then, I wouldn’t have bought Naked Colour shampoo and conditioner again. Naked is a brand that is exclusive to Boots. Whilst I think that Boots’ own brands are generally very good, Naked Colour has left me disappointed. If you want to try these products nonetheless, Naked shampoos and conditioners are available for £4.39 each.